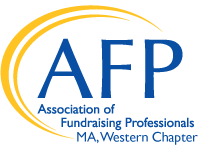 The Western MA Chapter of the Association of Fundraising Professionals is pleased to provide job postings to our members and non-members. Payment of $75 is required in advance per posting (job title). Once published, postings are available to view on our website for at least 30 days. Email announcements alerting list members of new posting(s) go out just once, usually on Fridays or over the weekend. Once payment is received, the job posting will be published to the website and sent out to our mailing list within 5 business days. Postings are not edited. They are posted as received. View our current postings in our Chapter Job Center.